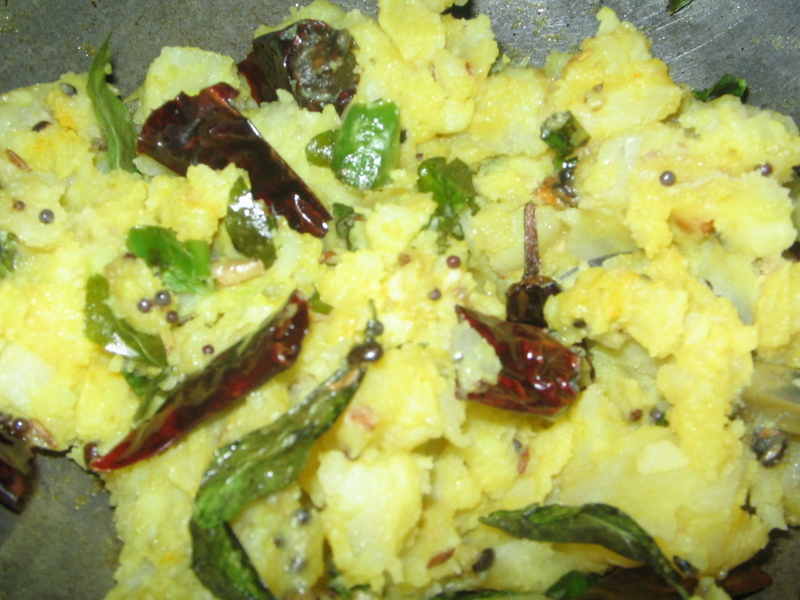 Aloo along with allam karam (Ginger and Green Chilli Paste) curry is one of the simplest way of cooking aloo. Place a pan on the stove,add oil to it.After it is heated add redchilli slits,jeera,mustard seeds,and toss well. Let them splutter,and after they stop spluttering add curry leaves,haldhi,hing and mix well in low flame.Lastly add Allam karam(ginger green mirchi paste) and toss well. Now add boiled and mashed aloo and salt and mix well.Let it remain on the stove for a few minutes and switch off the stove.After 10 minutes add lemon juice (optional)to the curry. Serve hot. Ideal with rotis and steamed white rice..
the alu curry looks very delicious but what is alam karam can u please explain? Nice aloo preparation...nice click...Do visit me.. Delicious kura, love it much.. I just love aloo in any form..this too looks super delicious!